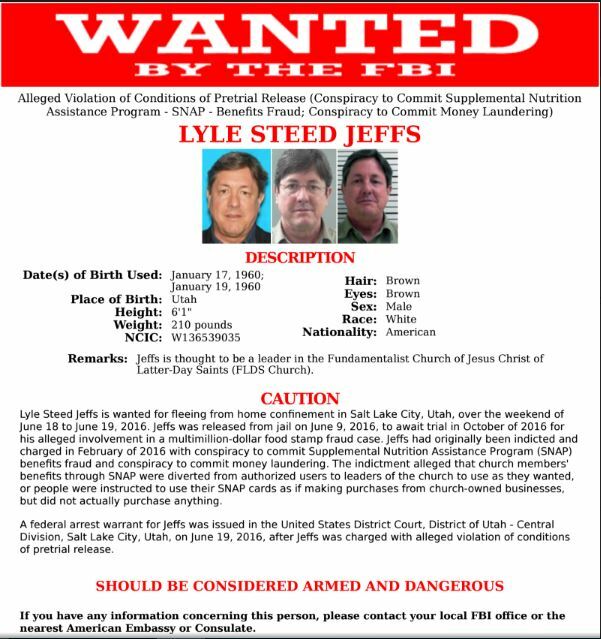 Lyle Jeffs, who is thought to be a leader in the Fundamentalist Church of Jesus Christ of Latter-Day Saints, is wanted for fleeing from home confinement in Salt Lake City sometime Saturday or Sunday. The FBI continues to search Tuesday for Lyle Jeffs, who the FBI said has possible hideout locations in the U.S., Canada and Mexico where there are known FLDS communities. The polygamous sect leader also has access to various modes of transportation, including planes and boats, the FBI said, adding that Lyle Jeffs is known to carry weapons and have armed bodyguards around him, so he is to be considered armed and dangerous. A federal arrest warrant for Lyle Jeffs was issued in the U.S. District Court, District of Utah, Sunday after his alleged violation of conditions of pretrial release. He had been released from jail on June 9 to await trial in October on charges of conspiracy to commit Supplemental Nutrition Assistance Program benefits fraud and conspiracy to commit money laundering. Lyle Jeffs and 10 others are accused of ordering FLDS church members to hand over food stamp benefits to leaders. Federal prosecutors claim the scheme exceeds $12 million in taxpayer dollars. Under conditions of the release, Lyle Jeffs was ordered to wear a GPS monitor and live in the Salt Lake City area – more than 300 miles from his community on the Utah-Arizona border – and have no contact with witnesses, co-defendants, any alleged victims or his brother, imprisoned FLDS leader Warren Jeffs, who was once on the FBI’s Ten Most Wanted list. Anyone with information on Lyle Jeffs’ whereabouts is urged to call the FBI Salt Lake City Field Office at 801-579­-1400 or a local FBI office. If he had a GPS on then how long did it take authorities to notice it was tampered with and he was gone? Careful Ladybug ! you just stunned law enforcement LOL. ! How about a wanted poster for Ted Stewart, The so called judge who let him out? Seems everyone knew of his devious nature and the support system that protects him, except the judge. Have you ever read or heard of one apologizing for making such an error? I’d be willing to bet there is an offshore account somewhere, that just had a really large deposit made to it. Has anyone looked into Judge Ted Stewart’s marriage arrangement? Is his wife 12 years old?….any of them? This “judge” should be run out of office AND town. Is there any way to recall this judge? How about an apology Judge Ted Stewart??? Or better yet, your immediate resignation! !